In this episode of Falmouth in Focus the Coast Guard upgrades their facilities in Woods Hole, the Woods Hole Public Library gives back to their patrons, we learn about cold water dangers, and much more! 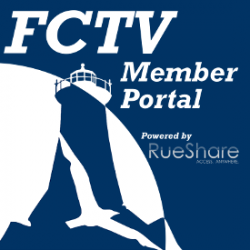 In this episode of Falmouth in Focus we learn about an adult coloring program, people take a plunge for a good cause, FCTV goes curling, and much more. In this episode of Falmouth in Focus we get a look at toy drive donations given to the Falmouth Service Center, check out some newly restored fountains, stop by a charity whiffle ball tournament, and much more! In this episode of Falmouth in Focus students work to help reduce ocean plastic, a social justice group holds a volunteer fair, the clean up of Great Harbor begins, and much more! In this special edition of Falmouth In Focus we take a look back at 2017 by sharing with you some of our favorite stories from the past year. From winter running tips to disaster relief benefits; from brigantine research vessels to underwater drones - you can see it all on this episode of Falmouth In Focus! In this episode of Falmouth in Focus: demonstrators stand up for a free internet, a police cruiser gets stuffed with gifts, and carolers come to Nobska Light. All this and much more on this edition of Falmouth in Focus. In the latest episode of Falmouth in Focus: we check out what the holiday season has brought to Heritage Museums & Gardens, stop by a multi-school track meet, speak with two authors about their new releases, and much more! In the latest episode of Falmouth in Focus: a local river begins a highly anticipated restoration project, State Representative Dylan Fernandes gives his first ever speech on the house floor, we give a wrap up of Falmouth's Fall Town Meeting, and much more! In the latest episode of Falmouth in Focus: fire and rescue workers are recognized for their service, the Barnstable County Sheriff details efforts to help victims of Hurricane Irma, Falmouth High students make decisions on their future. and much more! In the latest episode of Falmouth in Focus: we get a look inside our county jail, visit a highly anticipated autumn festival, check out a Falmouth fall tradition, and much more! In the latest episode of Falmouth in Focus: we check out a volunteer initiative to improve the homes of those in need, visit a community held demonstration in support of diversity, stop by an explosive open house, and more! In this episode of Falmouth in Focus we learn about a new autonomous underwater vehicle, check out what the fall is bringing to Highfield Hall, speak with Falmouth Clippers coach Derek Almeida about their 2017 season, and much more! In this episode of Falmouth in Focus we get an in-depth analysis of a new report on climate change, learn about a community emergency response initiative, detail the Falmouth Road Race’s role in supporting local nonprofits, and much more! In this episode of Falmouth in Focus we visit a rally to promote peace, check out a science themed walk in Woods Hole, break down how travel will be affected during the upcoming Falmouth Road Race and so much more! In this episode of Falmouth in Focus we stop by the book signing of a former first daughter, celebrate the reopening of Falmouth Station, learn about WHOI's new DunkWorks facility, and so much more! In this episode of Falmouth in Focus we see a preview of the 26th annual Woods Hole Film Festival, a dedication ceremony for the newly renovated Falmouth Commodores press box at Gov Fuller Field, and more. In this episode of Falmouth in Focus we see highlights from the Mashpee Wampanoag's 96th annual Pow-Wow, take a tour of West Falmouth's newly completed library, meet a cute tabby cat named Lilly Mae from People For Cats, get an overview of the Lawrence School's Building Blitz, and more! In this episode of Falmouth in Focus we visit a rally held at the Massachusetts State House, tour the Falmouth DPW's newly completed water treatment facility, and more! In this episode of Falmouth in Focus we learn about the Steamship Authority’s plans for a new office space in Falmouth, hop aboard Sea Education Association’s Sailing School Vessel, Corwith Cramer, visit with the Falmouth Farmers’ Market as they prepare for their second summer at Falmouth Marine Park, and go behind the scenes at Falmouth Fire Rescue to see how firefighters and paramedics are trained. All this, and much more. In this episode of Falmouth in Focus we go behind the scenes at a regional bridge tournament in North Falmouth, Celebrate Spring with Highfield Hall and Falmouth Village Association, look in at the Care for the Cape and Islands event at the Nobska Lighthouse, get a new perspective on life as a Muslim youth in America, and much more. This edition of Falmouth in Focus includes stories about: the March for Science, Daffodil Days at Spohr Gardens, an event to celebrate student poets for National Poetry month, and much, much more. In this episode of Falmouth in Focus we meet a local rescue dog who is making a difference on Joint Base Cape Cod, learn about a new exhibit at Heritage Museums and Gardens, see how Falmouth High School Seniors are getting prepared for life after graduation, and much more. In this episode of Falmouth in Focus we attend an event that helps parents find the signs of substance abuse in teens, see how the Teaticket School is sharing kindness within the Falmouth Community, learn how Cape Abilities is empowering those with developmental disabilities, take a plunge into the frigid waters of Falmouth Heights, and much more.